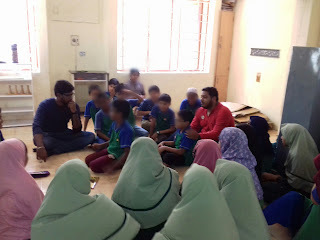 I was in Auroville a few months ago and the friends I was staying with talked about knowing a couple in Chennai who were running a unique school that combined the Montessori system with Islamic studies. Intrigued, I called up Aneesa Jamal while I was on the bus to Chennai and set up a meeting for the next morning. She told me that she had to rush with her senior students to a science fair at 9:00 AM so we could only talk for a half hour or so. She also told me that Hauroon Jamal, her husband and co-founder of their school, would be preparing to give an afternoon public lecture at the same science fair, and would probably not get the time to come to the school at all. In the freewheeling discussion I had with Aneesa, I think I delayed her leaving for the science fair but I got the full story and a guided tour. Aneesa also called Hauroon and asked him to come in specifically to meet me when she learnt that although he went to Madras and I to Kharagpur, we were both 1988 batch Civil Engineers from IIT. (Aneesa is a liberal arts graduate from Smith College and has an MBA from the University of Washington). When Aneesa and Hauroon relocated to India from the USA in 2003, they initially schooled their three children at home. They wanted an alternative, non-stressful education for their children but they also wanted them to learn Arabic and study the Quran. And in a school setting this would have meant a full school day and then extra Arabic classes in the evening. The three children studying at home were soon joined by a few others who were attracted by the idea. With the encouragement of some of the parents, Al Qamar Academy International School was soon born. The guided tour with Aneesa showed me three-four classrooms with quiet, busy, happy children going about their mysterious Montessori business. The youngest group was making chapathis, mausambi juice, silently observing others who were doing map puzzles, playing math games in ones and twos on their neatly and not-too-closely spread mats, and making an infinitesimal fraction of the noise one might expect in a room with 30 practically unsupervised children. At Al Qamar, the Montessori model goes up to the 4thstandard after which the children shift slowly to the IGCSE curriculum. The school goes up to 9th standard now and even at this level the children are mostly in the self-learning mode and the role of the teacher is to guide and respond to questions from the children rather than to ‘teach’. I waited for Hauroon to come in after Aneesa left and the first thing he said when he walked in was that he was sure that we had met before. It turned out that our paths had crossed 20 or so years ago when we were both working in Delhi and we discovered that we had many ideas and friends in common. Both Hauroon and Aneesa said that the school had taken on a life of its own and if they had known how much work it would involve they would not have started it in the first place. Well, the parents of the 120 well-settled children at Al Qamar must be glad that they did! Montessori up to 4th standard. 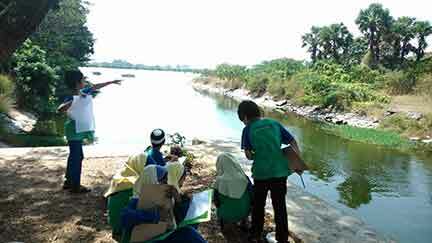 Islamic studies an integral part of the curriculum. No homework, exams, tuitions up to grade 7. Inquiry based science club where kids conduct science investigations (not canned science projects).